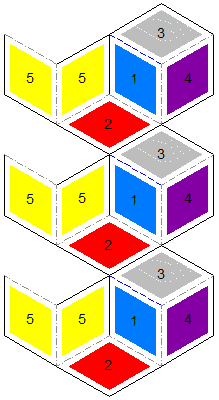 These flexagons are made from rhombuses, quadrilaterals where all four sides are equal length. Print them, cut them out and paste them back to back, giving you three different templates. Tape together the edge of side 1 from one template to the edge of side two from a second template. Tape together the edge of one side 1 from the second template to the edge of side two from the third template. 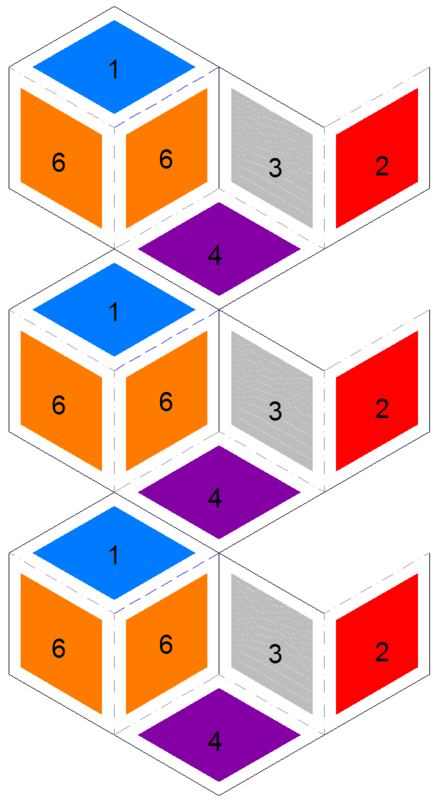 Start by folding adjacent 6's together. Continue by folding together adjacent 5's, 4's and 3's. The rhombus I've chosen to use here has two 60 degree angles and two 120 degree angles. This means that the flexagon lies flat if there are 6 leaves (a hexaflexagon) and the central angle is 60 degrees. If one of the 120 degree angles are in the center, the result is greater than 360 degrees so it doesn't lie flat. This rhombus flexagon has similar behavior to various triangle flexagons, including the triangle hexaflexagon and star dodecaflexagon. In the video I show the pinch flex, tuck flex and silver tetra flex, which are similar to flexes on triangle flexagons. One interesting note is that the pinch can combine with the box flex to produce a new flex.